Prime Minister Tayyip Erdogan did it again the other day when he accused BBC Turkish of hiring actors to make up a news story on the deadliest mining disaster in Turkey's history to undermine his government's image. The disaster might really be a watershed moment in the Turkish government's evolving modus operandi for dealing with the media, following its messy divorce from its ally-turned-nemesis, the Gulen movement. The most positive result of the rift for Turkey's democracy is the fact that there are far fewer journalists in Turkish prisons now compared to the heyday of the "holy alliance." 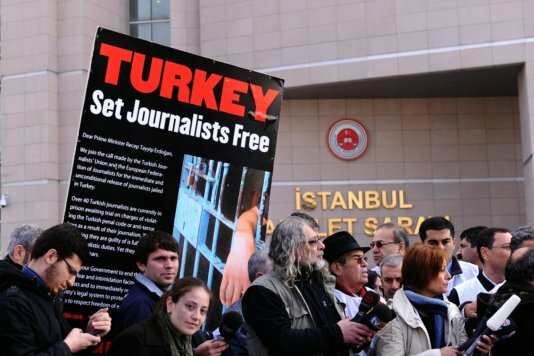 Turkish Journalists' Union had announced on April 25 that 43 journalists were still behind prison bars, while the Turkish government argues that only 15 inmates are journalists. By all means, the release of 10 journalists in May meant that Turkey finally got rid of that notorious title: "The worst jailer of journalists in the world." The recent releases in Turkey were thanks to a new law passed in March reducing the detention limit for suspects on trial from 10 years to five years. The initiative of the government could be traced back to December 17, 2013, when massive graft investigations targeting itself had been started by the prosecutors and the police chiefs who were allegedly Gulenists. Award-winning journalists Nedim Sener and Ahmet Sik were both arrested following their investigative works on the Gulenist network. Long gone are the days when journalists were arrested at their homes which were usually raided at dawn by the order of prosecutors and police officials belonged to "the Gulenist parallel structure." Instead, today's journalists in Turkey began facing systematic campaigns of slander and intimidation in pro-government newspapers, death threats on social media --and Prime Minister Tayyip Erdogan's increasingly stronger calls for media bosses to fire critical pundits and for his own voters to sue them in courts. Neither Erdogan's determination to have total control on information flow nor his attacks on foreign and national media nor pro-government media's partisan attacks on impartial reports like my own newspaper Hurriyet publish were novelties. However, we've seen for the first time in the past few days how Ankara might be strategically internationalizing its war on media, as pro-government campaigns take a dangerous turn. German magazine Der Spiegel withdrew its reporter Hasnain Kazim from Turkey on May 20, after he reportedly received some 10,000 death threats over a report in the wake of the Soma disaster. 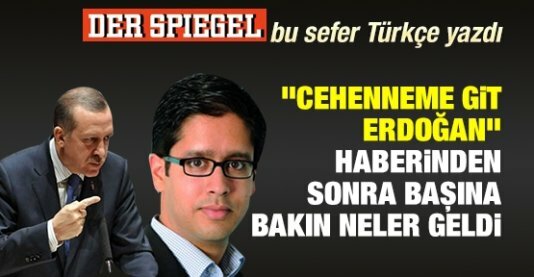 Several pro-government dailies had harshly slammed Der Spiegel's headline which quoted the reaction of a miner in Soma who said “Go to hell, Erdogan.” Yeni Şafak, one such newspaper, published a profile of Kazim, together with his photo, which was concluded: "What does the fact that journalist Hasnain Kazim sends abrasive, insultive and uninsubstantial reports targeting [Erdogan] mean?" 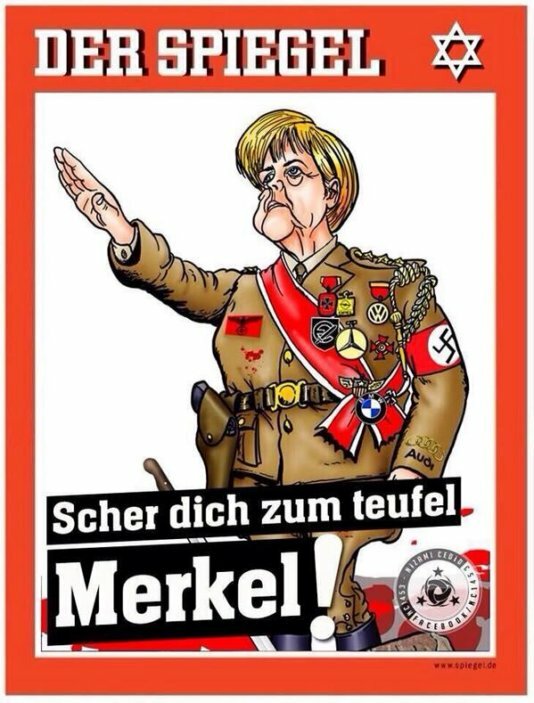 Erdogan criticized Der Spiegel during his May 24 visit in Cologne, Germany. "One of the headlines in a presumptuous magazine was meaningful. [The reporter] was sending me to hell. Apparently, he knows the way to hell," he said. "I did not say anything against the Prime Minister. I quoted a worker from Soma. Unfortunately some media put his words into my mouth - papers close to the government to show that I am against the government and papers close to the opposition to misuse me as a key witness. Fact is: I only reported, I did not comment, " Kazim told me by email after he returned to Germany. Kazim is not the only example. Erdogan, himself, directly targeted the BBC Turkish correspondents, as well as a Hurriyet columnist, while addressing to the ruling Justice and Development Party's (AKP) parliamentary group on May 20. "An international television station's correspondent in Turkey went [to Soma] and found players, making them play the part of so-called miners' relatives. They then service it to the whole world," he said. He repeated this allegation during his address to the ruling AKP's parliamentary group on May 27. It was daily Yeni Şafak again, which named the BBC and targeted its correspondent Rengin Arslan. The story, in which Arslan was accused of "high treason," was soon followed by a social media campaign and "wishes" for her to die. This is a subtle threat, compared to those flooded Kazim's Twitter timeline, like the one about "cutting his throat." Like Der Spiegel, the BBC stood by its report, stressing it verified that the women Erdogan talked about were really miners' relatives, not actors. As the Vienna-based International Press Institute's (IPI) National Committee in Turkey, we noted down other reports in the Turkish media, like a May 21 daily Yeni Akit article in which freelance journalist Piotr Zalewski, who reported for TIME, Financial Times and Foreign Policy, was labelled an "informant," while other media outlets, including mine, were either described as "Zionists" or "Zionist lovers." All these journalists, including Zalewski, did was sharing a front-page headline of Yeni Akit which ridiculously argued that foreign media "attacks" the Turkish government over the Soma disaster because the son-in-law of the mine's owner was Jewish! Journalists, particularly those who report in English, now feel a higher pressure in Turkey. "There were always hate mails from various sources -nationalists, Islamists, etc., but never organized campaigns and even death threats like today. It's sad to see to what extent certain circles in Turkey are ready to go," Daniel Steinvorth, Der Spiegel's Turkey correspondent from 2008 to 2011, told me on May 20. Although they have not been so aggressive and systematic before, journalists, whether foreigner or Turkish, faced such campaigns in the past, too. In April 2013, Haberturk daily had stopped publishing the opinion pieces written by Amberin Zaman, The Economist's correspondent in Turkey, after she was targeted in pro-government media and social media following her articles criticizing the Turkish government. After almost a year, it was revealed, and then admitted by Erdogan, how much Turkish PM was involved in Haberturk newsmaking. "The attacks against Kazim are part of a broader and systematic campaign of seeking to discredit and to intimidate foreign reporters, who unlike their Turkish peers are able to report the facts accurately and objectively. The demonization of foreign media also bolsters the government's narrative about global Jewish forces out to get them," Zaman told me. Selin Girit, another BBC reporter, had been labelled as "an agent" and "traitor" by Ankara Mayor Melih Gokcek on June 23, 2013, because of her reporting. After BBC's Girit, Gokcek had targeted CNN International, claiming that the U.S. broadcaster was "lying." "Once your name is in circulation, the dirt they fling lasts even if you do everything to defend yourself and your report. A journalist should be able to talk to everybody; but when you're labelled, your contacts stop talking to you and it hampers your work. This is a dangerous situation not only for journalists, but also for the public's right to be informed," Girit told me during a telephone conversation on May 21. "They do this because they cannot put editorial pressure [on the BBC]. Hence, they put this pressure on individuals," she added. 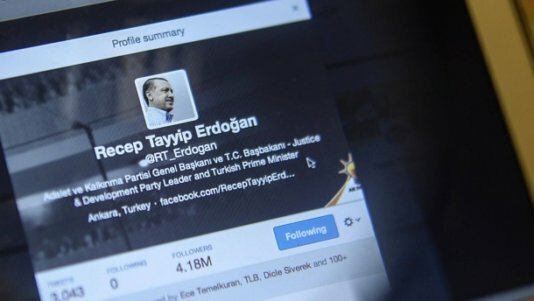 Erdogan, himself, had criticized Girit on June 25, 2013, for live-tweeting the Gezi Park protests, which kickstarted the change in the government's strategy for controlling the flow of information. After Gezi, Ankara found out that lashing at journalists individually and channeling public pressure on them could have a more limited effect on the government's international image than the Gulenist-led arrests of the past, while still bearing the potential to keep these nasty individuals "in line." "Psychological pressure put on journalists, especially a perception that their lives are in danger, can affect their performance. Even if they're not affected at all, the AKP doesn't lose anything with such campaigns. Far from causing Erdogan to lose votes, accusing foreign powers can even reinforce his electoral support. Many Turks like conspiracy theories, as we all know," told me a colleague, who was subjected to a slander campaign on social media months ago, on condition of anonymity. This is why pro-government circles are apparently systematizing their criticism on media, as they pick individual targets now: After the December 17 graft investigations, which marked the beginning of a total war between the AKP and the Gulenists, Turkish PM had accused the Wall Street Journal -and the BBC, again- for "siphoning off [Turkey's] resources and energy." I wrote about "the AKP's social media army" after I was personally targeted in an apparently orchestrated pro-government attack on social media last November. The pro-government forces, as well as some opposition figures, then mobilized bots, in a move that also largely failed. Twitter was blocked by Ankara one day after I reported in my newspaper that it started to delete the pro-government bots and fake accounts in Turkey. Yes, public opinion can be manipulated on social media, too, but truth ultimately prevails on this new domain which has no gatekeepers like we got used to; a fact that could lead to the failure of any government's strategy to dominate the flow of information. Yes, threats and attacks can indeed turn an individual's life to hell, but the system of governance, anywhere in the world, is bound to be democratized soon or late, thanks to the new kind of interaction between public, media and institutions. In the end, a multifaceted, bottom-up, democratic medium would surely evolve faster than a monophonic, top-down, autocratic one. Emre Kizilkaya is an Istanbul-based journalist. He is the Vice President of the Turkish National Committee of Vienna-based International Press Institute and the Managing Editor of Hürriyet Daily News, the English-language edition of Turkey's largest newspaper. His blog, The Istanbulian, is the first English-language blog of a Turkish journalist who works for a major newspaper in Turkey.